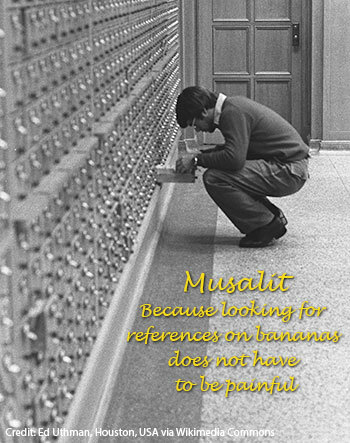 Musalit is a bibliographic database of references on bananas. It currently contains 17,682 references most of which are of journal articles (64%), followed by conference papers (19%), books and book chapters (13%), theses (2%) and others (2%), in English (70%), Spanish (16%), French (10%) and 20 other languages (4%). A PDF is freely available for 40% of the references, either directly from the record or through a link on the publisher’s website. The former include all the Bioversity International publications on bananas for which a PDF is available (including those published by INIBAP), and the postprints of the papers in the proceedings of the ISHS-ProMusa symposia, which are made available one year after their publication in Acta Horticulturae. The journal Fruits, whose online archive only goes back to 2003, gave us permission to make freely available the PDFs of the articles on bananas published between 1946 and 2002. So far, we have made available 301 PDFs. We also continue our efforts to ensure that all the open access and restricted publications that have become accessible from the Internet after their inclusion in the database are linked from their Musalit record. If you find any errors in a bibliographic record, would like to add a reference or have information about a missing link, please contact us. We also welcome comments on how to improve Musalit.